It is yet another morning where I am sitting at work at 10am desperately trying to keep my eyes open. These days I've been doing more work in the early hours of the morn while I should be sleeping than during the conventional work-day. Hopefully TheBrad will have his computer set up again by the end of today and I can get a weeks break from stand-by ... until, that is, he heads off to the Caribbean and it's all mine for 6 solid weeks - yelp! Anyway, yesterday evening wasn't all bad. Varen got his new tattoo :) I designed it actually. Sounds bizarre, I know. But I just stylised his family crest for him. On your right is the design I did for him and once it's healed I'll be sure to post a real picture of it :) I sat an held his hand. The first time I've been in a tattoo parlor. It was quicker than I expected and came out really nicely. I thin k if you're going to get a tattoo it should be something important and meaningful to you ... I'm not into those random ones of a Chinese symbol or a butterfly or whatever. So I like the idea of this ... even tho I was skeptical at first. After that we went to watch The Prestige. It all begins in rapidly changing, turn-of-the-century London. At a time when magicians are idols and celebrities of the highest order, two young magicians set out to carve their own paths to fame. The flashy, sophisticated Robert Angier is a consummate entertainer, while the rough-edged purist Alfred Borden is a creative genius who lacks the panache to showcase his magical ideas. They start out as admiring friends and partners. But when their biggest trick goes terribly awry, they become enemies for life – each intent on outdoing and upending the other. Trick by trick, show by show, their ferocious competition builds until it knows no bounds, even utilizing the fantastical new powers of electricity and the scientific brilliance of radical inventor Nikola Tesla – while the lives of everyone around them hang in the balance. I loved it. 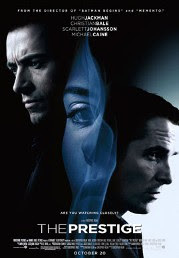 It was fabulous and clever and had a great cast ... although Hugh Jackman is always preferable as Wolverine than any other character (and Scarlett Johansson is preferable in any other movie that I'm not watching ;) ). Definitely a must see movie! And then it was home to Production issues which continued thru out the night up until I left for work this morning. Blegh. But, on the huge plus side ... I'm off to Cape Town for the weekend this afternoon! Yay! Look out Pickley Fizz, here I come :) I cannot wait to see you, my puppies. Mostly I'm off to visit Gum (Mom's Dad). He hasn't been doing so well lately and is about to be checked into a Frail Care Home so, it's best I visit now. Although Mom has spent the last few weeks trying to prepare me over the phone for the difference I'll notice in him. A little nervous for that. thanks for holding my hand.. it hurt like no-one's business ;-) but it is absolutely gorgeous..
yeah well, I like it when there are only 5 or so other people in the cinema ... then you can usually be far enough away not to hear them even if they are in the habit of chatting thru a feature film!